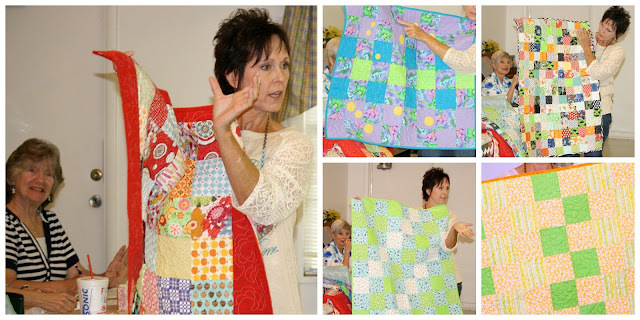 "The pattern went in the trash and the quilt came close to it because of many problems. There was several of us at NAGS group that were working on it at the same time, no one was motivated to finished it. But thanks to Nancy Tubb bringing hers to the meetings each month and reminding me that this UFO needed finished I finally got it done." Wanda Jackson showed us a very big quilt she made in a "Jelly Roll Race"
This vintage "Friendship" quilt is from the same friend. Close up of the Friendship quilt. Judy Tiedeman showed a pretty red and white top she calls "Galloping Horse"
Connie Hansen shows a "Foot of the Month" quilt she completed. "A Foot of the Month is like a block of the month club, but we focus on all the things our machine will do with a specialty foot. We make a block just using that foot. " Connie also made a turquoise and brown Feathered Star for a friends' wedding present. The back is as gorgeous as the front. Connie quilted it on an embroidery machine. Vickie Mazurek showing 5 quilts she made for the Wee Care program from her scrap squares. She likes to use the the Bonnie Hunter scrap users system to keep her scraps in neat and tidy and in order. Easy Rail Fence pattern from Missouri Star Quilt.